WARNING: THIS POST CONTAINS SPOILERS (from the 1930s through 2016…). Also, there are lots of pictures. All images are the property of DC Comics, their parent company, subsidiary, or affiliate, or the creators or artists involved with each image. Okay, so, who is the Joker? Who is Alfred Stryker? Why do I say “The First Joker”? In Detective Comics #27 The Bat-Man foils the murderous plot of one Alfred Stryker. It ends with Stryker falling into a vat of chemicals at his factory, Apex Chemicals – he is presumed dead. Detective Comics #27, Alfred Stryker, owner of Apex Chemical Corp.
Stryker tumbles into the vat of acid. 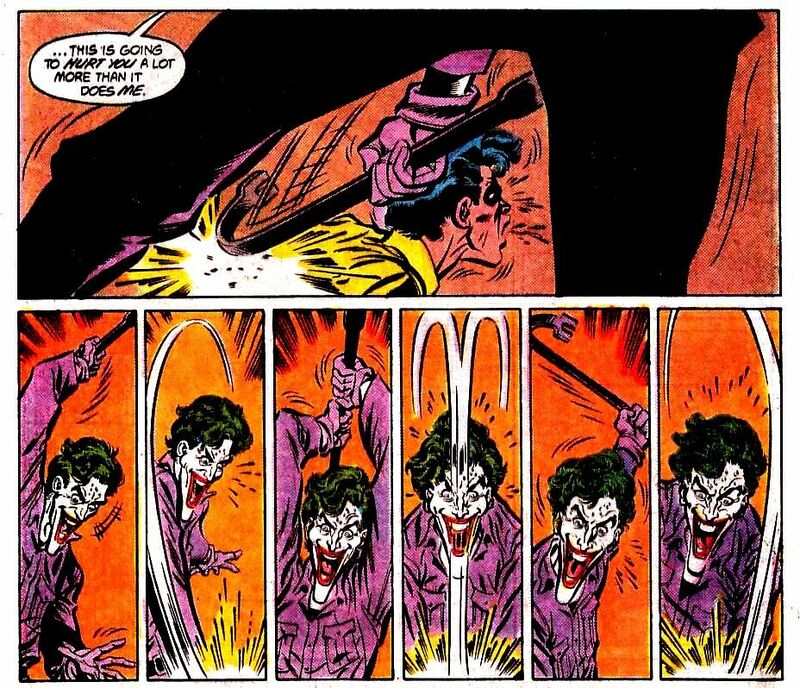 In Detective Comics #168 the Red Hood jumps into a tank of chemical runoff and is “transformed”, later becoming the Joker (introduced without an origin in Batman #1, one year after Batman’s creation and ten years prior to the Red Hood origin story). This tank is at a card factory. The Red Hood jumps into a tank of chemicals to escape Batman. Red Hood escapes and becomes The Joker. In Batman Vol. 2 #13 (New 52, start of the Death of the Family story arc) Batman and Joker go back to “where it all began”, which a panel reveals to be Ace Chemical. Joker is doing his own dirty work. We know reality has been messed with a few times, most recently revealed by the Rebirth storyline (and before that was Convergence); Rebirth was immediately preceded by the realization that there are THREE Jokers. So it is not unreasonable to believe that origin stories have been combined, skewed, or otherwise adjusteded as the story of Batman has progressed. The first Joker is the one on the left. For Detective Comics Vol. 2 #27 DC revisited the first batman story – publishing it in it’s original entirety, and doing a special story. Here is the updated version of Alfred Stryker. And he’s in the vat!!!! They each learn who the Joker is firsthand. I know that this isn’t a novel idea, others have had this same thought; but I think new developments make it worth revisiting, and as long as DC doesn’t release his identity (which I actually like) we’re going to keep having fun with it! As a side note, Joker of The Killing Joke appears to me to be the second Joker.